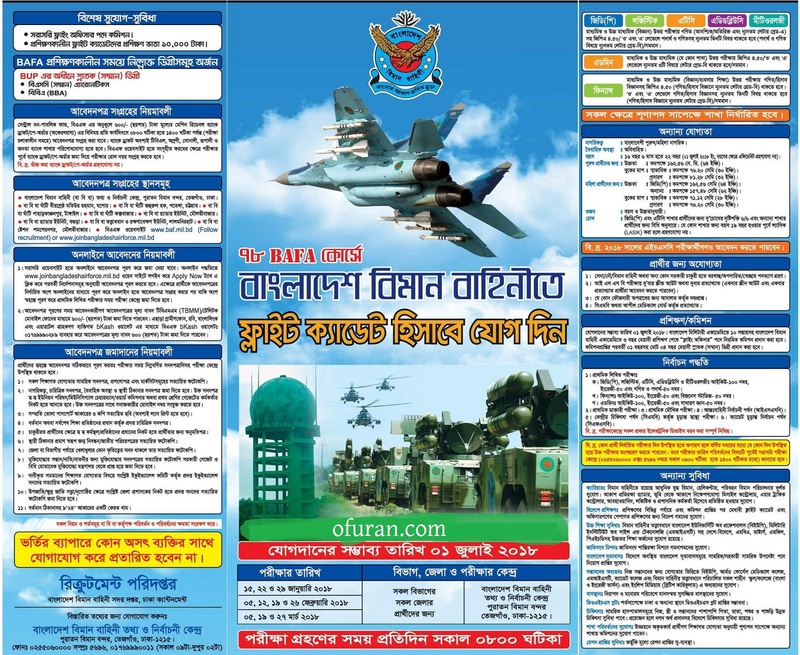 BD Airforce has published 78 BAFA Course job circular notice to join as flight cadet officer in Bangladesh Airforce. Joining date is on 01 July, 2018. Exam date 15, 22, 29 January, 2018; 05, 12, 19, 26 February, 2018 and 05, 19, 27 March, 2018 for all district's applicants. Exam centre is Bangladesh Airforce Information and selection center, Old Airport, Tejgaon, Dhaka. Examination time is at 08 am everyday. Last date for 78 BAFA Course job is thus listed above, i:e; before the examination at any day. Age: 16 years 6 months to 22 years on 01 July, 2018. Chest: male- 30 to 32 inches. Female: 28 to 30 inches. 2018 HSC applicants can also apply for 78 BAFA Course job. See details about 78th BAFA course job on the circular below.